Hinshaw, Abel J., age 26, born in Indiana; father born in S.C. [sic]; mother born in Delaware; farmer. Hinshaw, Nancy A., wife, age 22, born in Indiana; parents birthplace "don't know"; keeping house. Hinshaw, Sarah E., daughter, age 3, born in Indiana. 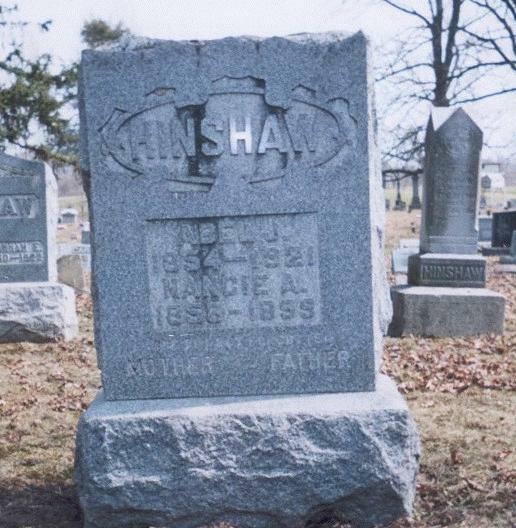 Hinshaw, Able, head-of-household, age 46, born Feb 1854 in Indiana; father born in North Carolina; mother born in Delaware; farmer; widower. Hinshaw, Cora, daughter, age 18, born May 1882 in Indiana; parents born in Indiana. Hinshaw, Nora R., daughter, age 16, born Dec 1883 in Indiana; parents born in Indiana; attended school. Hinshaw, Fred, son, age 10, born Nov 1889 in Indiana; parents born in Indiana; attended school. Hinshaw, Fred, head-of-household, age 31, born in Indiana; parents born in Indiana; rented home; occupation: farmer, general farm. Hinshaw, Burleigh, wife, age 32, born in Indiana; parents born in Indiana. Hinshaw, A.J., father, age 65, born in Indiana; father born in North Carolina; mother born in Delaware; widower; occupation: retired. Abel's death was reported in "The Indianapolis Star" (Indianapolis, Indiana) on Wednesday, August 10, 192119 (see scan below). 1880 census, Washington Township, Randolph County, Indiana; ED 173, page 267A, line #27, dwelling #65, family #65. 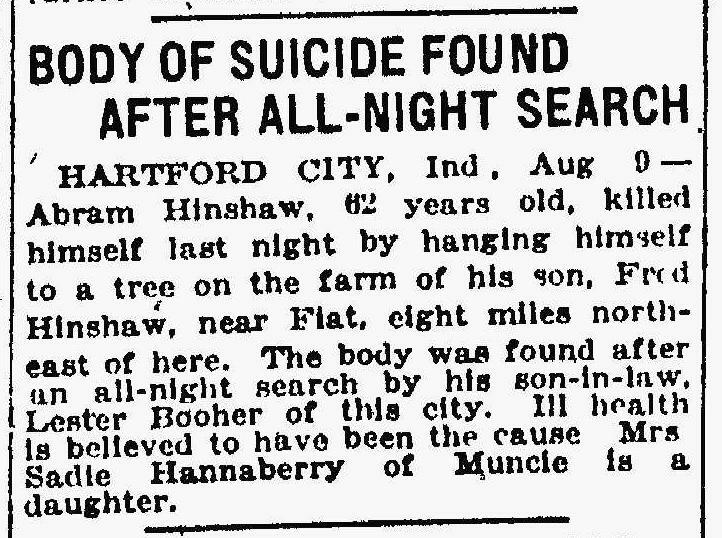 Death of Abel Hinshaw; "The Indianapolis Star", Aug 10 1921. Indiana Works Progress Administration, 1938. Cora H. Hinshaw marriage record. 1900 census, Penn Township, Jay County, Indiana; ED 65, page 121B, line #55, dwelling #213, family #219. 1870 census, Winchester P.O., Greensfork Township, Randolph County, Indiana; page 336B, line #24, dwelling #315, family #315. Indiana Marriages, 1845-1920; http://www.ancestry.com (county bk page 19). 1880 census, Washington Township, Randolph County, Indiana; ED 173, page 267A, line #24, dwelling #64, family #64. 1880 census, Washington Township, Randolph County, Indiana; ED 173, page 267A, line #36, dwelling #68, family #68. 1880 census, Washington Township, Randolph County, Indiana; ED 173, page 267A, line #42, dwelling #70, family #70. 1880 census, Washington Township, Randolph County, Indiana; ED 173, page 267A, line #45, dwelling #71, family #71. 1880 census, Washington Township, Randolph County, Indiana; ED 173, page 267A, line #49, dwelling #72, family #72. 1880 census, Washington Township, Randolph County, Indiana; ED 173, page 267A, line #31, dwelling #67, family #67. 1900 census, Penn Township, Jay County, Indiana; ED 65, page 121A, line #36, dwelling #210, family #216. 1920 census, Harrison Township, Blackford County, Indiana; roll T625-423, ED 1, page 5A, line #33, dwelling #97, family #101.